The term "4K" is generic and refers to any resolution with a horizontal pixel count of approximately 4,000. (p2) Several different 4K resolutions have been standardized by various organizations. In 2012, the International Telecommunication Union, Radiocommunication Sector published Recommendation ITU-R BT.2020, also known as the Ultra High Definition Television (UHDTV) standard. This standard adopts the same image parameters defined in SMPTE ST 2036-1. Although the UHDTV standard does not define any official names for the formats it defines, ITU typically uses the terms "4K", "4K UHD", or "4K UHDTV" to refer to the 3840 × 2160 system in public announcements and press releases ("8K" for the 7680 × 4320 system). In some of ITU's other standards documents, the terms "UHDTV1" and "UHDTV2" are used as shorthand. The CEA definition does allow manufacturers to use other terms—such as 4K—alongside the Ultra HD logo. (p9) Since the resolution in CEA's definition is only a minimum requirement, displays with higher resolutions such as 4096 × 2160 or 5120 × 2880 also qualify as "Ultra HD" displays, provided they meet the other requirements. Some 4K resolutions, like 3840 × 2160, are often casually referred to as 2160p. This name follows from the previous naming convention used by HDTV and SDTV formats, which refer to a format by the number of pixels/lines along the vertical axis (such as "1080p" for 1920 × 1080 progressive scan, or "480i" for the 480-line interlaced SDTV formats) rather than the horizontal pixel count (≈4000 or "4K" for 3840 × 2160). The term "2160p" could be applied to any format with a height of 2160 pixels, but it is most commonly used in reference to the 4K UHDTV resolution of 3840 × 2160 due to its association with the well-known 720p and 1080p HDTV formats. Although 3840 × 2160 is both a 4K resolution and a 2160p resolution, these terms cannot always be used interchangeably since not all 4K resolutions are 2160 pixels tall, and not all 2160p resolutions are ≈4000 pixels wide. However, some companies have begun using the term "4K" to describe devices with support for a 2160p resolution, even if it is not close to 4000 pixels wide. For example, many "4K" dash cams only support a resolution of 2880 × 2160 (4∶3); although this is a 2160p resolution, it is not a 4K resolution. Samsung also released a 5120 × 2160 (64∶27) TV, but marketed it as a "4K" TV despite its 5K-class resolution. YouTube and the television industry have adopted 3840 × 2160 as their 4K standard. As of 2014[update], 4K content from major broadcasters remains limited. On April 11, 2013, Bulb TV created by Canadian serial entrepreneur Evan Kosiner became the first broadcaster to provide a 4K linear channel and VOD content to cable and satellite companies in North America. The channel is licensed by the Canadian Radio-Television and Telecommunications Commission to provide educational content. However, 4K content is becoming more widely available online including on YouTube, Netflix, and Amazon. By 2013, some UHDTV models were available to general consumers in the range of US$600. As of 2015[update], prices on smaller computer and television panels had dropped below US$400. In 2014, the Digital Video Broadcasting Project released a new set of standards intended to guide the implementation of high resolution content in broadcast television. Dubbed DVB-UHDTV, it establishes two standards, known as UHD-1 (for 4K content) and UHD-2 (for 8K content). These standards use resolutions of 3840 × 2160 and 7680 × 4320 respectively, with framerates of up to 60 Hz, color depth up to 10 bpc (30 bit/px), and HEVC encoding for transmission. DVB is currently focusing on the implementation of the UHD-1 standard. DVB finalized UHD-1 Phase 2 in 2016, with the introduction of service by broadcasters expected in 2017. UHD-1 Phase 2 adds features such as high dynamic range (using HLG and PQ at 10 or 12 bits), wide color gamut (BT. 2020/2100 colorimetry), and high frame rate (up to 120 Hz). YouTube, since 2010, and Vimeo allow a maximum upload resolution of 4096 × 3072 pixels (12.6 megapixels, aspect ratio 4:3). Vimeo's 4K content is currently limited to mostly nature documentaries and tech coverage. High Efficiency Video Coding (H.265) should allow streaming 4K content with a bandwidth of 20 to 30 Mbit/s. In January 2014, Naughty America launched the first adult video service streaming in 4K. The first commercially available 4K camera for cinematographic purposes was the Dalsa Origin, released in 2003. 4K technology was developed by several research groups in universities around the world, such as University of California, San Diego, CALIT2, Keio University, Naval Postgraduate School and others that realized  several demonstrations in venues such as IGrid in 2004 and CineGrid. YouTube began supporting 4K for video uploads in 2010 as a result of leading manufacturers producing 4K cameras. Users could view 4K video by selecting "Original" from the quality settings until December 2013, when the 2160p option appeared in the quality menu. In November 2013, YouTube began to use the VP9 video compression standard, saying that it was more suitable for 4K than High Efficiency Video Coding (HEVC). Google, which owns YouTube, developed VP9. Theaters began projecting movies at 4K resolution in 2011. Sony was offering 4K projectors as early as 2004. The first 4K home theater projector was released by Sony in 2012. Sony is one of the leading studios promoting UHDTV content, as of 2013[update] offering a little over 70 movie and television titles via digital download to a specialized player that stores and decodes the video. The large files (≈40 GB), distributed through consumer broadband connections, raise concerns about data caps. In 2014, Netflix began streaming House of Cards, Breaking Bad, and "some nature documentaries" at 4K to compatible televisions with an HEVC decoder. Most 4K televisions sold in 2013 did not natively support HEVC, with most major manufacturers announcing support in 2014. Amazon Studios began shooting their full-length original series and new pilots with 4K resolution in 2014. They are now currently available though Amazon Video. In March 2016 the first players and discs for Ultra HD Blu-ray—a physical optical disc format supporting 4K resolution and HDR at 60 frames per second—were released. In 2016, Sony and Microsoft released the PlayStation 4 Pro and Xbox One S, respectively, both of which are video game consoles that support 4K streaming, although in most cases the resolution is upscaled to 4K; the Xbox One S also features an Ultra HD Blu-ray disc drive. On November 7, 2017 Microsoft released the Xbox One X, which is capable of native 4K streaming and gaming. Though experiencing rapid price drops beginning in 2013 for viewing devices, the home cinema digital video projector market saw little expansion, with only a few manufacturers (only Sony as of 2015[update]) offering limited 4K-capable lineups, with native 4K projectors commanding five-figure price tags well into 2015 before finally breaking the US$10,000 barrier. Critics state that at normal direct-view panel size and viewing distances, the extra pixels of 4K are redundant at the ability of normal human vision. Projection home cinemas, on the other hand, employ much larger screen sizes without necessarily increasing viewing distance to scale. JVC has used a technique known as "e-shift" to extrapolate extra pixels from 1080p sources to display 4K on screens through upscaling or from native 4K sources at a much lower price than native 4K projectors. This technology of non-native 4K entered its fourth generation for 2016. JVC used this same technology to provide 8K flight simulation for Boeing that met the limits of 20/25 visual acuity. Pixel shifting, as described here, was pioneered in the consumer space by JVC, and later in the commercial space by Epson. That said, it isn't the same thing as "true" 4K. More recently, some DLP projectors claim 4K UHD (which the JVCs and Epsons do not claim). As noted above, DCI 4K is 4096 × 2160, while 4K UHD is 3840 × 2160, producing a slight difference in aspect ratio rather than a significant difference in resolution. Traditional displays, such as LCD or OLED, are 3840 pixels across the screen, with each pixel being 1/3840th of the screen width. They do not overlap—if they did, they would suffer reduced detail. The diameter of each pixel is basically 1/3840th of the screen width or 1/2160th of the screen height - either gives the same size pixel. That 3840 × 2160 works out to 8.3 megapixels, the official resolution of 4K UHD (and therefore Blu-ray UHD discs). The 4K UHD standard doesn't specify how large the pixels are, so a 4K UHD projector (Optoma, BenQ, Dell, et al.) counts because these projectors have a 2718 × 1528 pixel structure. Those projectors process the true 4K of data and project it with overlapping pixels, which is what pixel shifting is. Unfortunately, each of those pixels is far larger: each one has 50% more area than true 4K. Pixel shifting projectors project a pixel, shift it up to the right, by a half diameter, and project it again, with modified data, but that second pixel overlaps the first. In other words, pixel shifting cannot produce adjacent vertical lines of RGBRGB or other colors where each line is one pixel (1/3840th of the screen) wide. Adjacent red and green pixels would end up looking like yellow, with a fringe on one side of red, on the other of green - except that the next line of pixels overlapps as well, changing the color of that fringe. 4K UHD or 1080p pixel shifting cannot reveal the fine detail of a true 4K projector such as those Sony ships (business, education and home markets). Also, JVC has one true 4K projector priced at $35,000 (as of mid-2017). So while 4K UHD sounds like it has a pixel structures with 1/4 the area of 1080p, that does not happen with pixel shifting. Only a true 4K projector offers that level of resolution. That's why "true" 4K projectors cost so much more than 4K UHD projectors with otherwise similar feature sets. They produce smaller pixels, finer resolution, no compromising of detail or color from overlapping pixels. By comparison, the slight difference in aspect ratio between DCI and 3840 × 2160 pixel displays without overlap is insignificant relative to the amount of detail. In November 2014, United States satellite provider DirecTV became the first pay TV provider to offer access to 4K content, although limited to selected video-on-demand films. In August 2015, British sports network BT Sport launched a 4K feed, with its first broadcast being the 2015 FA Community Shield football match. Two production units were used, producing the traditional broadcast in high-definition, and a separate 4K broadcast. As the network did not want to mix 4K footage with upconverted HD footage, this telecast did not feature traditional studio segments at pre-game or half-time, but those hosted from the stadium by the match commentators using a 4K camera. BT envisioned that if viewers wanted to watch studio analysis, they would switch to the HD broadcast and then back for the game. Footage was compressed using H.264 encoders and transmitted to BT Tower, where it was then transmitted back to BT Sport studios and decompressed for distribution, via 4K-compatible BT TV set-top boxes on an eligible BT Infinity internet plan with at least a 25 Mbit/s connection. In late 2015 and January 2016, three Canadian television providers – including Quebec-based Videotron, Ontario-based Rogers Cable, and Bell Fibe TV, announced that they would begin to offer 4K compatible set-top boxes that can stream 4K content to subscribers over gigabit internet service. On October 5, 2015, alongside the announcement of its 4K set-top box and gigabit internet, Canadian media conglomerate Rogers Communications announced that it planned to produce 101 sports telecasts in 4K in 2016 via its Sportsnet division, including all Toronto Blue Jays home games, and "marquee" National Hockey League games beginning in January 2016. Bell Media announced via its TSN division a slate of 4K telecasts to begin on January 20, 2016, including selected Toronto Raptors games and regional NHL games. On January 14, 2016, in cooperation with BT Sport, Sportsnet broadcast the first ever NBA game produced in 4K – a Toronto Raptors/Orlando Magic game at O2 Arena in London, England. On January 20, also during a Raptors game, TSN presented the first live 4K telecast produced in North America. Three days later, Sportsnet presented the first NHL game in 4K. Dome Productions, a joint venture of Bell Media and Rogers Media (the respective owners of TSN and Sportsnet), constructed a "side-by-side" 4K mobile production unit shared by Sportsnet and TSN's first 4K telecasts; it was designed to operate alongside a separate HD truck and utilize cameras capable of output in both formats. For the opening game of the 2016 Toronto Blue Jays season, Dome constructed "Trillium" – a production truck integrating both 4K and 1080i high-definition units. Bell Media's CTV also broadcast the 2016 Juno Awards in 4K as the first awards show presented in the format. In February 2016, Univision trialed 4K by producing a closed circuit telecast of a football friendly between the national teams of Mexico and Senegal from Miami in the format. The broadcast was streamed privately to several special viewing locations. Univision aimed to develop a 4K streaming app to publicly televise the final of Copa América Centenario in 4K. In March 2016, DirecTV and CBS Sports announced that they would produce the "Amen Corner" supplemental coverage from the Masters golf tournament in 4K. After having trialed the technology in limited matches at the 2013 FIFA Confederations Cup, and the 2014 FIFA World Cup (via private tests and public viewings in the host city of Rio de Janeiro), the 2018 FIFA World Cup was the first FIFA World Cup in which all matches were produced in 4K. Host Broadcasting Services stated that at least 75% of the broadcast cut on each match would come from 4K cameras (covering the majority of main angles), with instant replays and some camera angles being upconverted from 1080p sources. These broadcasts were made available from selected rightsholders, such as the BBC in the United Kingdom, and selected television providers in the United States. The resolution of 3840 × 2160 is the dominant 4K resolution used in the consumer media and display industries. This is the resolution of the UHDTV1 format defined in SMPTE ST 2036-1, as well as the 4K UHDTV format defined by ITU-R in Rec. 2020, and is also the minimum resolution for CEA's definition of Ultra HD displays and projectors. The resolution of 3840 × 2160 was also chosen by the DVB Project for their 4K broadcasting standard, UHD-1. This resolution has an aspect ratio of 16∶9, with 8,294,400 total pixels. It is exactly double the horizontal and vertical resolution of 1080p (1920 × 1080) for a total of 4 times as many pixels, and triple the horizontal and vertical resolution of 720p (1280 × 720) for a total of 9 times as many pixels. It is sometimes referred to as "2160p", based on the naming patterns established by the previous 720p and 1080p HDTV standards. Televisions capable of displaying UHD resolutions are seen by consumer electronics companies as the next trigger for an upgrade cycle after a lack of consumer interest in 3D television. The DCI 4K standard has twice the horizontal and vertical resolution of DCI 2K (2048 × 1080), with four times as many pixels overall. Digital movies made in 4K may be produced, scanned, or stored in a number of other resolutions depending on what storage aspect ratio is used. In the digital cinema production chain, a resolution of 4096 × 3112 is often used for acquiring "open gate" or anamorphic input material, a resolution based on the historical resolution of scanned Super 35mm film. 4096 × 2560 (1.60∶1 or 16∶10); this resolution was used in the Canon DP-V3010, a 30-inch (76 cm) 4K reference monitor designed for reviewing cinema footage in post-production, released in 2013. 4096 × 2304 (1.77∶1 or 16∶9); this resolution was used in the 21.5-inch (55 cm) LG UltraFine 22MD4KA 4K monitor, jointly announced by LG and Apple in 2016. 3840 × 1600 (2.40∶1 or 12∶5); a number of computer monitors with this resolution have been produced to date, the first of which was the 37.5-inch (95 cm) LG 38UC99-W released in 2016. 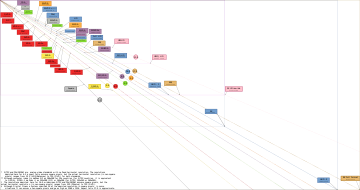 This resolution is equivalent to WQXGA (2560 × 1600) extended in width by 50%, or 3840 × 2160 reduced in height by ≈26%. LG refers to this resolution as "WQHD+" (Wide Quad HD+), while Acer uses the term "UW-QHD+" (Ultra-wide Quad HD+) and some media outlets have begun using the term "UW4K" (Ultra-wide 4K). 3840 × 1080 (3.55∶1 or 32∶9); this resolution was first used in the Samsung C49HG70, a 49-inch (120 cm) curved gaming monitor released in 2017. This resolution is equivalent to dual 1080p displays (1920 × 1080) side-by-side, but with no border interrupting the image. It is also exactly one half of a 4K UHD (3840 × 2160) display. Samsung refers to this resolution as "DFHD" (Dual Full HD). The main advantage of recording video at the 4K standard is that fine spatial detail is resolved well. If the final video quality is reduced to 2K from a 4K recording, more detail is apparent than would have been achieved from a native 2K recording. Increased fineness and contrast is then possible with output to DVD and Blu-ray. Some cinematographers record at 4K with the Super 35 film format to offset any resolution loss that may occur during video processing. With Axiom devices there is some open source hardware available that uses a 4K image sensor. ^ Goulekas, Karen (2001). Visual Effects in a Digital World. Morgan Kaufmann. p. 587. ISBN 9780080520711. 4K resolution: A general term referring to any digital image containing an X resolution of approximately 4096 pixels. ^ "First Quarter 2015 4K TV Growth Strong As Overall LCD TV Shipments Slow, IHS Says". IHS Inc. 8 June 2015. Retrieved November 24, 2015. ^ "The exploding 4K market: Nearly 50% of U.S homes to have UHD TVs by 2020 according to new study -". Retrieved 2017-11-25. ^ Mark Hoelzel (2 September 2014). "4K TV Shipments Are Ramping Up Much Faster Than HD TV Did In The Past". Business Insider. Retrieved November 24, 2015. ^ a b c d e "Digital Cinema System Specification Version 1.2 with Errata as of 30 August 2012 Incorporated" (PDF). Digital Cinema Initiatives, LLC. October 10, 2012. Archived from the original (PDF) on 2016-05-27. Retrieved April 29, 2018. ^ "4K vs. UHD: What's the difference? – ExtremeTech". ^ Swinson, Peter (November 2005). "DCI and Other Film Formats" (PDF). Peter Swinson Associates, Limited. Retrieved April 29, 2018. ^ "Defining 2K & 4K". Cinematography Mailing List. March 25, 2004. Retrieved April 29, 2018. ^ "2K Film Resolution". CGSociety. June 6, 2003. ^ "what resolution/retio/frame rate?". CreativeCOW.net. September 25, 2002. Retrieved April 29, 2018. ^ "WEAPON/EPIC-W 8K S35 Operation Guide v7.0" (PDF). Red Digital Cinema Camera Company. Archived from the original (PDF) on May 28, 2018. Retrieved May 28, 2018. ^ "SMPTE OV 2036-0:2015". Society of Motion Picture and Television Engineers (SMPTE). March 27, 2015. Archived from the original on May 28, 2018. ^ a b "Ultra High Definition Television: Threshold of a new age". ITU-R. May 24, 2012. Retrieved April 29, 2018. ^ "ITU-R Recommendation BT.2020-2: Parameter values for ultra-high definition television systems for production and international programme exchange" (PDF). ITU-R. October 2015. Retrieved April 29, 2018. ^ "New ITU reports help shape next TV revolution: High Dynamic Range (HDR)". ITU News. ITU-R. November 21, 2017. Retrieved April 29, 2018. ^ "ITU-R Recommendation BT.2077-2: Real-time serial digital interfaces for UHDTV signals" (PDF). ITU-R. June 2017. Retrieved April 29, 2018. ^ "Consumer Electronics Industry Announces Ultra High-Definition". Digital Photography Review. October 19, 2012. Retrieved April 29, 2018. ^ a b "CEA Updates Characteristics for Ultra High-Definition Displays". Consumer Electronics Association (CEA). June 24, 2014. Retrieved April 29, 2018. ^ Nick Pino, Jon Porter (March 8, 2018). "4K and Ultra HD: Everything you need to know about the hot new resolution". Tech Radar. Archived from the original on August 19, 2018. Retrieved September 1, 2018. ^ Alexander Thomas. "Just how useful is 2160p aka 4K?". Archived from the original on November 26, 2017. Retrieved September 1, 2018. ^ "STERIO 4K 2880x2160/P24 Dash Cam". Amazon.com. Archived from the original on September 1, 2018. Super HD 4K 2880x2160P Resolution and 170 Degree A+ Ultra Wide Angle---Record every detail with the latest technique of car video shooting. ^ "AUKEY 4K Dash Cam". Amazon.com. Archived from the original on September 1, 2018. Retrieved September 1, 2018. An advanced image sensor and super-wide field of view capture everything in ultra-sharp 4K(2880 x 2160 @24fps) video with HDR. ^ Mike Wheatley (July 30, 2014). "Samsung & LG Begin Sales of 105" 21:9 4K, Nay, 5K TV". HDTVtest. Archived from the original on 2017-09-09. Retrieved September 1, 2018. ^ "Leading Television Industry Players Line Up To Support '4K Ultra HD'" (Press release). Consumer Electronics Association. 11 November 2014. Retrieved 18 December 2014. ^ Brown, Heather (16 October 2014). "Good Question: When Will We See Broadcasts In 4K?". Local. CBS Minnesota. Retrieved 18 December 2014. ^ "Canadian Serial Entrepreneur to Launch First 4,000-pixel Television Signal, Bulb TV". 11 April 2013. Archived from the original on 2013-08-12. Retrieved 12 November 2013. ^ "Broadcasting Decision CRTC 2012-268". 4 May 2012. ^ Luckerson, Victor (12 November 2014). "Amazon Will Stream in Ultra-High Def 4K by January". Tech Companies. Time. Retrieved 18 December 2014. ^ Anderson, Jim (17 December 2014). "4K Ultra HD, High Quality: Red". YouTube. Retrieved 18 December 2014. ^ Cox, Joe (27 June 2013). "Seiki launches 39in 4K TV for $699". What Hi-Fi. Haymarket. Retrieved 21 January 2014. ^ Greenwald, Will (28 June 2013). "Seiki SE39UY04". PC Mag. Ziff Davis. Retrieved 21 January 2014. ^ "Viewsonic monitor". Newegg.com. Retrieved 21 November 2015. ^ Rivington, James (July 7, 2014). "4K TV channels on the way as DVB-UHDTV standard is approved". TechRadar. Future Publishing Limited. Retrieved April 29, 2018. ^ a b c "Phasing in Ultra High Definition" (PDF). www.dvb.org. DVB Project Office. February 2017. Retrieved April 29, 2018. ^ "DVB On Course for Future UHDTV System" (PDF). www.dvb.org. Geneva: DVB Project Office. November 18, 2015. Retrieved April 29, 2018. ^ Jukic, Stephanie. "4K & Ultra HD Resolution". 4K.com. Retrieved 26 November 2014. YouTube has had a 4K channel running since as early as 2010 and other developments are definitely on the horizon, especially in countries or regions with excellent internet connectivity that goes above the normal speeds available to most people. ^ Ramesh Sarukkai (2010-07-09). "What's bigger than 1080p? 4K video comes to YouTube". Archived from the original on 16 July 2011. Retrieved 2011-08-20. ^ "Advanced encoding settings". Google. Retrieved 21 January 2014. ^ Ohannessian, Kevin. 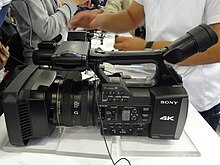 "Where Can You Get 4K Video?". Toms's Guide. Purch, Inc. Retrieved 26 November 2014. YouTube and Vimeo already stream 4K content. Most of the videos are of the nature/documentary variety, with some tech media coverage thrown in the mix. However, Google recently announced plans to make a much larger selection of 4K video available on YouTube, using its new compression technology, called VP9. If your computer has a powerful graphics card that supports 4K and HDMI version 1.4 or higher, you can connect your computer to a 4K television via an HDMI cable. You will likely need high bandwidth to stream the video without any issues, though neither YouTube nor Vimeo has specified the minimum data speed needed for 4K streaming. Asus, Dell, Sharp, and others make 4K computer monitors. ^ Anderson, Jim. "4K Ultra HD Test, High Quality BLUE". YouTube. Retrieved 1 April 2015. ^ Ryan Lawler (25 January 2013). "Next-Gen Video Format H.265 Is Approved, Paving The Way For High-Quality Video On Low-Bandwidth Networks". TechCrunch. AOL. Retrieved 30 May 2014. ^ "Payserve Launches 4k Ultra-HD Site, Sindrive". Adult Video News. Retrieved 23 January 2016. ^ Frost, Jacqueline B (2009). Cinematography for Directors: A Guide for Creative Collaboration. Michael Wiese Productions. p. 199. ISBN 1-61593019-1. Retrieved 21 January 2014. ^ "Dalsa Origin was the very first commercially obtainable 4K Resolution". epfilms. Retrieved 19 June 2016. ^ Ramsey, Doug (Aug 24, 2009). "Film Premiere in Cyberspace Links Brazil, U.S. and Japan". Retrieved May 24, 2018. ^ a b Teoh, Vincent (25 December 2013). "YouTube Adds "2160p 4K" Option To Video Quality Settings". HDTVTest. Retrieved 24 May 2014. ^ "Youtube puts in new 2160p 4K option for video-settings". Neo win. Retrieved 24 July 2014. ^ Truong, Alice (August 6, 2013). "4K is already playing at a theater near you, but you probably didn't even notice". Digital Trends. Designtechnica. Retrieved 24 May 2014. ^ "Sony Unveils New "4k" Digital Cinema Projector" (press release). Projector Central. June 3, 2004. Retrieved 24 May 2014. ^ Quick, Darren (May 31, 2012). "Sony releases world's first 4K home theater projector". Gizmag. Retrieved 24 May 2014. ^ Denison, Caleb (September 4, 2013). "Sony feeds starving 4K early adopters with over 70 titles of 4K movies and TV shows". Digital Trends. Retrieved 31 May 2014. ^ Katzmaier, David (8 April 2014). "Netflix begins 4K streams". CNET. Retrieved 30 May 2014. ^ Kerr, Dara (17 December 2013). "Amazon Studios to begin shooting original series in 4K". CNET. Retrieved 30 May 2014. ^ "List of 4k UHD Movies & TV Shows on Amazon Video – HD Report". hd-report.com. Retrieved 2017-11-25. ^ "The first ever Ultra HD 4K Blu-ray player has gone on sale a little bit early". The Verge. Retrieved 2017-11-25. ^ "Xbox One X review". The Verge. Retrieved 2017-11-25. ^ Katzmaier, David (March 30, 2015). "Sony VPL-VW350ES review". CNET. Retrieved December 7, 2015. ^ Pendlebury, Ty (September 26, 2013). "JVC debuts cheaper pseudo-4K projectors". CNET. Retrieved December 7, 2015. ^ "DLA-X550R Overview". JVC. Retrieved December 7, 2015. ^ Silva, Robert (October 16, 2015). "JVC Intros 4th Generation e-Shift 4K Projectors at CEDIA 2015". About.com. Retrieved December 7, 2015. ^ Cohen, Steven (October 19, 2015). "JVC Readies New eShift 4K D-ILA Projectors with HDR". High-Def Digest. Retrieved December 7, 2015. ^ Turnbull, Grant (November 25, 2015). "I/ITSEC 2015: New training approaches for Boeing". Shephard Media. Retrieved December 7, 2015. ^ "DirecTV launches 4K exclusive to Samsung TVs". CNET. Retrieved 15 April 2016. ^ "BT Sport Ultra HD Made Even My Mum Want to Watch 4K Football". Gizmodo UK. Retrieved 24 January 2016. ^ "Behind the scenes of BT Sport's 4K Ultra HD revolution". Techradar. Retrieved 23 January 2016. ^ a b "4K content becomes a reality in Canada". Toronto Star. Retrieved 21 January 2016. ^ "Why you should add a 4K television to your holiday shopping list". The Globe and Mail. Retrieved 16 January 2016. ^ a b "TSN delivers live 4K broadcast of Raptors-Celtics". TSN.ca. Retrieved 15 January 2016. ^ "Rogers announces Ignite Gigabit internet, 4K sports broadcasts". CBC News. Retrieved 16 January 2016. ^ "4K Sports Descend on Canada: First-Ever Live 4K NBA Game From London Kicks Off Parade of 4K Content". Sports Video Group. Retrieved 16 January 2016. ^ "Sportsnet to produce first NHL game in 4K". Sportsnet.ca. Rogers Media. Retrieved 24 January 2016. ^ "Dome Productions Preps for Arrival of Live 4K Sports in Canada". Sports Video Group. Retrieved 16 January 2016. ^ "Dome, Rogers Sportsnet Develop Single Production Solution for UHD/HD". Sports Video Group. Retrieved 21 April 2016. ^ "Juno Awards 2016: The Weeknd, Bieber, Dean Brody among winners". CBC News. Retrieved 21 April 2016. ^ "SVG Exclusive: Univision to produce Copa América Centenario final in 4K". Sports Video Group Europe. Retrieved 12 March 2016. ^ "How Univision is beating the competition to 4K sports streaming". Engadget. Retrieved 12 March 2016. ^ "Mexico vs Senegal friendly is a test for 4K". TechRadar. Retrieved 12 March 2016. ^ "DirecTV's first live 4K show is the Masters golf tournament". Engadget. Retrieved 12 March 2016. ^ "The Masters in 4K: DirecTV, CBS Sports Tee Up First Live 4K UHD Broadcast in U.S." Sports Video Group. Retrieved 12 March 2016. ^ "FIFA Confederations Cup Testing 4K; Might Lead to World Cup 'Ultra HD' Broadcast". The Hollywood Reporter. Retrieved 2018-11-24. ^ "4K TV misses its World Cup goal". The Verge. Retrieved 2018-11-24. ^ "Fox, Telemundo Offer a Clearer View of FIFA World Cup Russia". TV Technology. Retrieved 2018-11-24. ^ "World Cup 2018: BBC to show tournament in Ultra HD & virtual reality". BBC Sport. 2018-05-30. Retrieved 2018-11-24. ^ "FuboTV streaming World Cup in 4K resolution". SportsPro. Retrieved 2018-11-24. ^ David S. Cohen (1 August 2013). "Ultra-HD TV Faces Bandwidth Challenge to Get Into Homes". variety.com. Variety Media. Retrieved 30 May 2014. ^ "Resolution Table". Resolution Table. Pixar. Retrieved 21 January 2014. ^ "4K resolution Definition from PC Magazine Encyclopedia". PC Magazine. 1994-12-01. Retrieved 2010-05-28. ^ James, Jack (2006). Digital Intermediates for Film and Video. Taylor & Francis. p. 125. ISBN 0240807022. Retrieved 21 January 2014. ^ "Canon DP-V3010 4K Reference Display" (PDF). Canon. Retrieved April 29, 2018. ^ Brandon Chester (October 27, 2016). "LG Introduces New UltraFine 4K and 5K Monitors". Anandtech. Anandtech. Retrieved April 29, 2018. ^ Nebojsa Novakovic (March 28, 2003). "IBM T221 - the world's finest monitor?". The Inquirer. Incisive Business Media (IP) Limited. Retrieved April 29, 2018. ^ Jim Tanous (March 13, 2018). "3840x1600 Ultrawide Monitors: How 160 Lines Can Make All the Difference". PC Perspective. Retrieved April 29, 2018. ^ "LG 38UC99-W Ultrawide Monitor". Retrieved April 29, 2018. ^ "Acer XR382CQK bmijqphuzx (UM.TX2AA.001)". ^ Singleton, Micah (June 14, 2017). "Dell's latest ultrawide monitor is a 38-inch curved beast". The Verge. Retrieved April 29, 2018. ^ Thacker, Jim (September 17, 2017). "HP announces new 37.5-inch curved Z38c display". CG Channel. Archived from the original on January 12, 2018. Retrieved April 29, 2018. ^ Paul Lilly (June 9, 2017). "Samsung launches insanely wide 32:9 aspect ratio monitor with HDR and FreeSync 2". PC Gamer. Retrieved April 29, 2018. ^ a b Wootton, Cliff (2005). A Practical Guide to Video and Audio Compression: From Sprockets and Rasters to Macroblocks. Taylor & Francis. p. 47. ISBN 0-24080630-1. Retrieved 21 January 2014. ^ Braverman, Barry (2013). Video Shooter: Storytelling with HD Cameras. CRC Press. pp. 4–18. ISBN 1-13605885-0. Retrieved 21 January 2014. ^ Sawicki, Mark (2007). Filming the Fantastic: A Guide to Visual Effects Cinematography. CRC Press. p. 114. ISBN 1-13606662-4. Retrieved 21 January 2014. ^ "Zynq-based Axiom Alpha open 4K cine camera proto debuts in Vienna hackerspace". 2014-03-20. ^ "Axiom Alpha: Die Open-Hardware-Kamera" [Axiom α: the open hardware camera]. Heise (in German). 2014-05-22. "Japan demonstrates next-gen TV Broadcast", Electronic Engineering Times . Super Hi-Vision, JP: NHK . Science & Technical Research Laboratories, JP: NHK . Super Hi-Vision research (annual report), JP: NHK STRL, 2009, archived from the original on 2012-10-18, retrieved 2013-01-29 . "4K resolution video test sequences for Research", Ultra video, FI: TUT .